LAWRENCE, Kan.- Senior Lagerald Vick’s career-high 32 points, including a perfect line from three-point range, lifted the No. 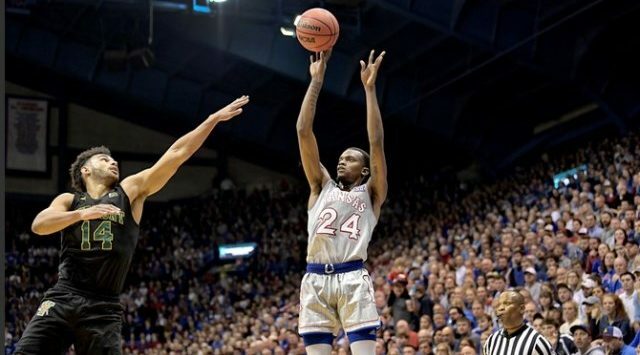 2 Kansas Jayhawks to an 84-68 win over the Vermont Catamounts Monday night inside Allen Fieldhouse. The victory moved the Jayhawks to 2-0 on the year and marked their 46th-consecutive home-opening win, while Vermont suffered its first blemish of 2018-19, now at 1-1. Vick’s hot night started early as the senior out of Memphis knocked down his first two attempts from deep to put KU up 6-0 less than a minute into the contest. The visitors were not intimidated though as VU stopped the early Jayhawk surge and managed to build an eight-point lead before four minutes could tick off the clock, leading 16-8 by the under-16 minute media timeout. From there the Catamounts kept the Jayhawks at arm’s length before Vick’s fourth 3-pointer of the half at the seven-minute mark pulled the Jayhawks within four points, 29-25, and kick-started a strong KU close to the half. Udoka Azubuike dunked in two of his 23 points to begin a 7-0 Jayhawk run to close the half as the team claimed a 40-36 advantage as it headed to the halftime locker room. The Kansas run extended into the second half as the Jayhawks begin the frame on a 13-4 stretch that pushed its lead to 53-40 and was capped by yet another Vick three-pointer. That shot was the first of three-straight treys by the senior that pushed KU’s lead to 59-45 with 11:20 remaining. From there a group effort helped KU to the finish line as Vick, Azubuike, sophomore Charlie Moore and freshman Quentin Grimes accounted for 20 of their team’s final 25 points, to close out the Catamounts with an 84-68 win. Ending his night with a perfect 8-of-8 from 3-point range, Vick became the first Jayhawk in program history to make eight threes without a miss. He closed the night with a career-high 32 points on 10-of-12 shooting and was joined in double-figures by Azubuike, who tallied his eighth-career double-double with 23 points and 11 rebounds. Grimes also posted a double-double, the first of his young career. He scored 10 points and dished out 10 assists in the win.